In 2073, Roger Soaring Owl was attacked on the streets of Denver. Witnesses were not clear on just what attacked him, but most say it was meaner, stronger, and faster than any metahuman. Now it's 2074. It's time to find out what Roger Soaring Owl learned. Corporate machinations don't get any meaner than this. Rivals of the megacorporation are certain it's hiding some dark secrets, and they're willing to spend significant nuyen to uncover this formation. Runners are going to have to infiltrate an Ares Subsidiary and gain the corporation's trust if they want to discover the secret - and if they do, they will have to find a way to survive with what they have learned. 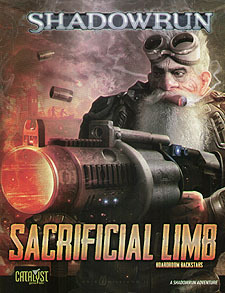 Sacrificial Limb is the second in the Boardroom Backstabs series of adventure for Shadowrun. It has plot information, NPC details, player handouts, and everything needed to throw player into the depths of corporate espionage, digging for the paydata the megacorps want to keep hidden. Sacrificial Limb is for use with Shadowrun, Twentieth Anniversary Edition.